G20-1From July 7 to 8, 2017 the G-20 will meet in Hamburg, Germany to discuss the state of the world. They will try to solve its most urgent problems – or at least make them manageable. They will talk about the future of this world. So let us do the same, or even better: let us express what everybody should know by now: THIS world in THESE conditions has no future! Despite its enormous techological opportunies, despite sufficient ressources and despite its vast treasure of historical experience the question arises how long we will be able to go on like this. The conditions under which people scrape a living and reproduce – let us call it capitalism – produce squalor: unemployment, inequality in its different forms and poverty and death. Capitalism has nothing on offer to oppose the wars, the displacement, the terror and the uncertainty. In its deluded strife for growth it floods our world with garbage and also produces “human garbage” through marginalisation, as stated by Pope Francis. And above all: It creates a lack of alternatives and infects people with it: Some defend a globalised and seemingly open capitalist world (such as the Fed. Rep. of Germany), others put their hopes in authoritarian, non-democratic politics (in different ways in Brazil, Russia or Turkey). Many people all over the world are convinced that there is no alternative. Increasingly they support right-wing, nationalist and anti-democratic demands, without realising that this will cement their misery or that they have only a limited chance to defend their humble wealth against the others. Meanwhile capitalism and its logic are devouring the last bits of democracy which it had granted us now and then. It is therefore hardly surprising when during this year’s G-20 meeting government and state heads, finance ministers and central bank chiefs, the International Monetary Fund, the World Bank and the OECD are discussing the problems of our world and its future. However, there will be no social movements, peace initiatives, eco groups. 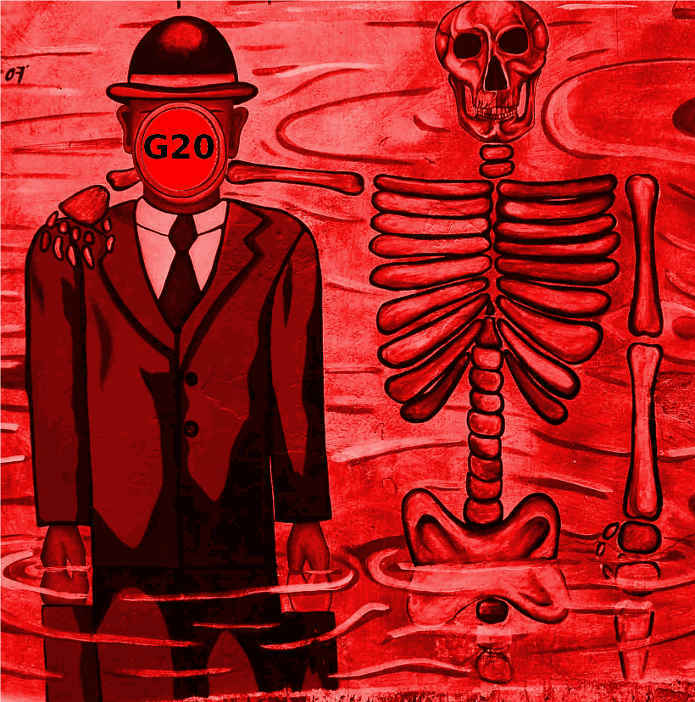 In a major spectacle the G-20 will sell us their own miserable and hopeless politics as a way out of the manifold crises of the world and present themselves as problem solvers. g20-2As Christians we believe that we have something to offer in reply to this hopelessness, yes, we feel obliged to do so. From our history, from the biblical tradition we are familiar with exploitation, misery and injustice, which produces rich and poor people. However, these stories also tell us for how long people have been putting their hopes and beliefs in a world which is different. This hope of a world in the here and now, which is fundamentally different, a world of justice and life in abundance for everybody still fills us today. Our hope is fed by the courage of many people who are prepared to rise and oppose these conditions with their desire for a different world, for a different life. This is why as Christians we call on you to take part in the protests against the meeting of the G-20 in Hamburg on July, 7 and 8! We will not let THIS world full of misery have the final word. We live in this world and this is why we feel obliged to oppose it. Let us confront the idol of capital, the logic of exploitation and growth with our hope of a life in abundance for all! Let us contrast the dreary boredom, the eternal continuity of capitalism with our fantasy and creativity! Together let us build the “common house”, a world which has room for many worlds.